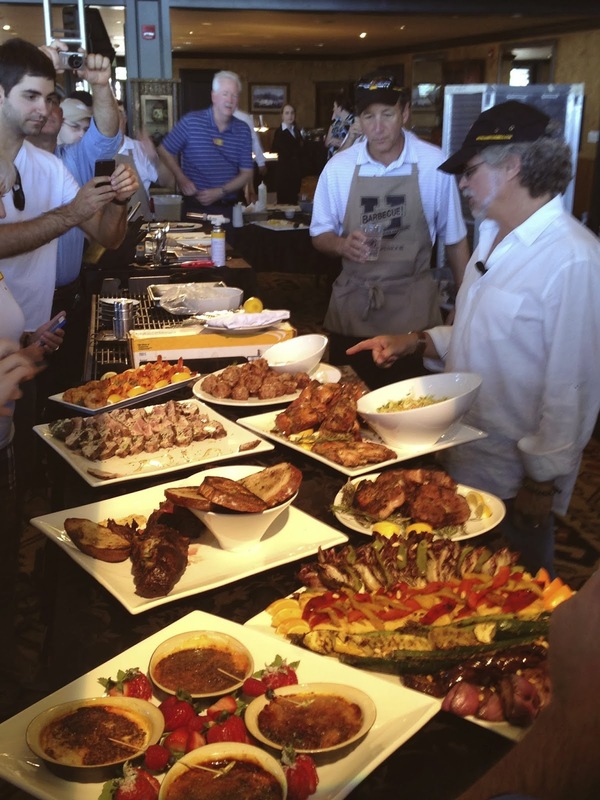 Some food does more than sustain us. Through the alchemy of smoke and time, there is food that can also nourish your soul. 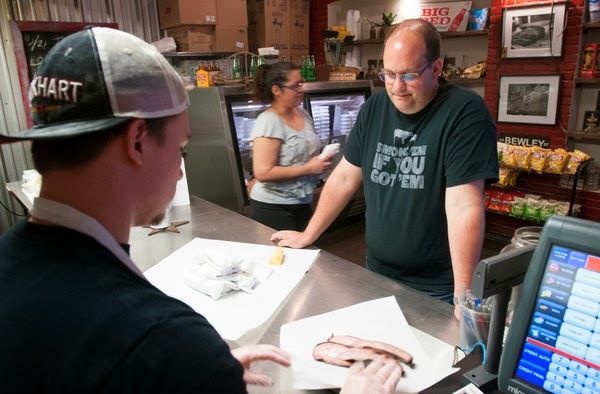 This site is dedicated to praising those that have mastered this art and perhaps even teaching a few to fish for themselves. 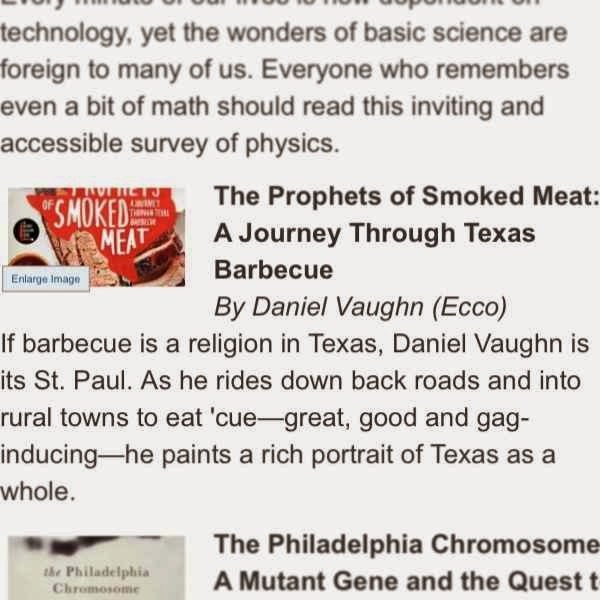 While most BBQ review books, magazine articles, and websites will tell you the best places, this website will tell you which places are good, mediocre, and awful. 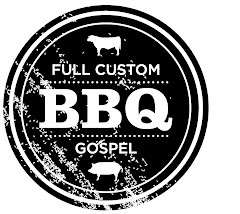 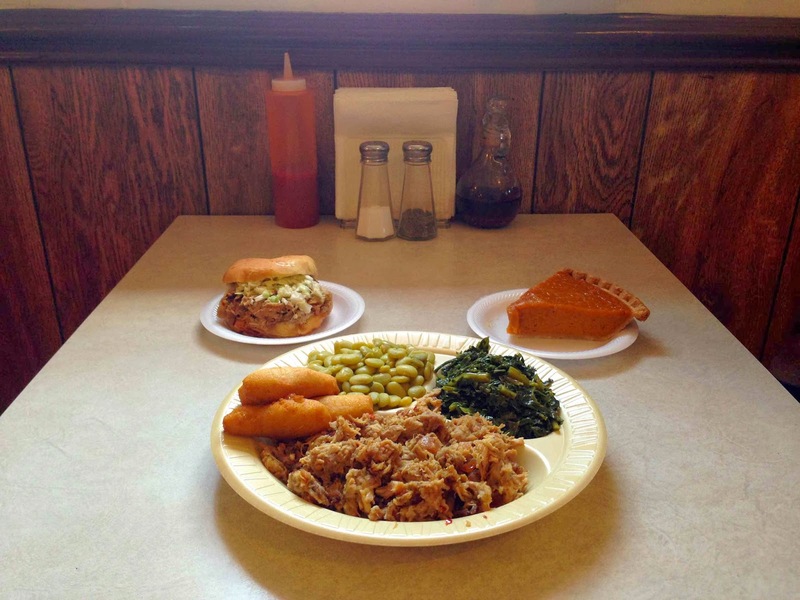 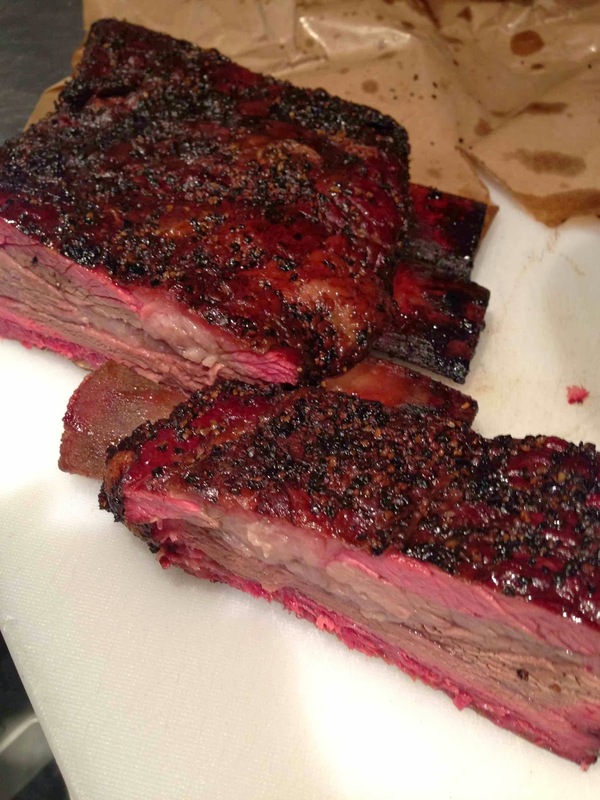 We suffer through bad BBQ so you don't have to. 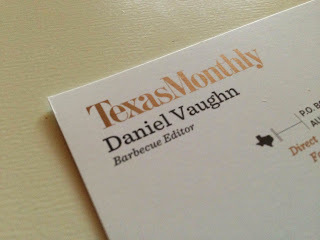 My year started like everyone else's back in January, but my new life really began with an article on Eater National announcing my new role as Barbecue Editor for Texas Monthly. 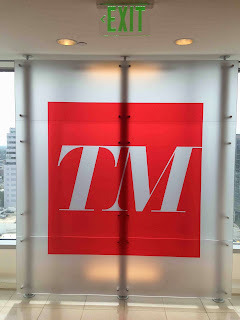 That was Thursday, March 21st. 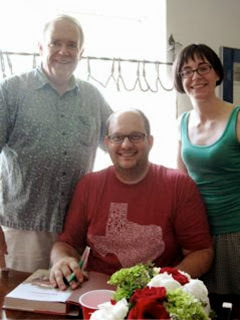 I still had six days left of my six year tenure at Good Fulton & Farrell, a Dallas architecture firm. 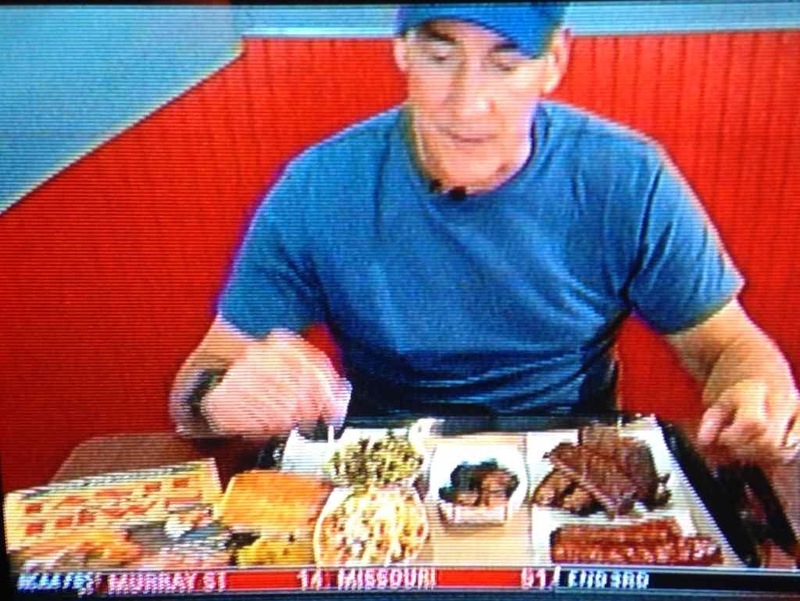 You can imagine how productive that final week was. 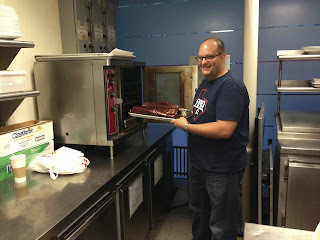 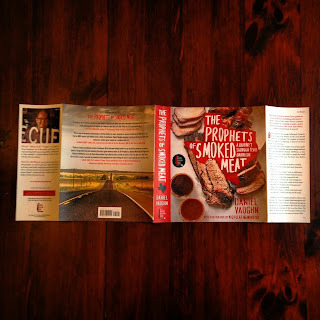 Before that day I had spent a couple months of the year editing my book, The Prophets of Smoked Meat, for publication. It was to come out two months later in Anthony Bourdain's new line of books with Ecco, but Manny Fernandez of the New York Times wanted to talk about this new Barbecue Editor position the evening of the Eater announcement. 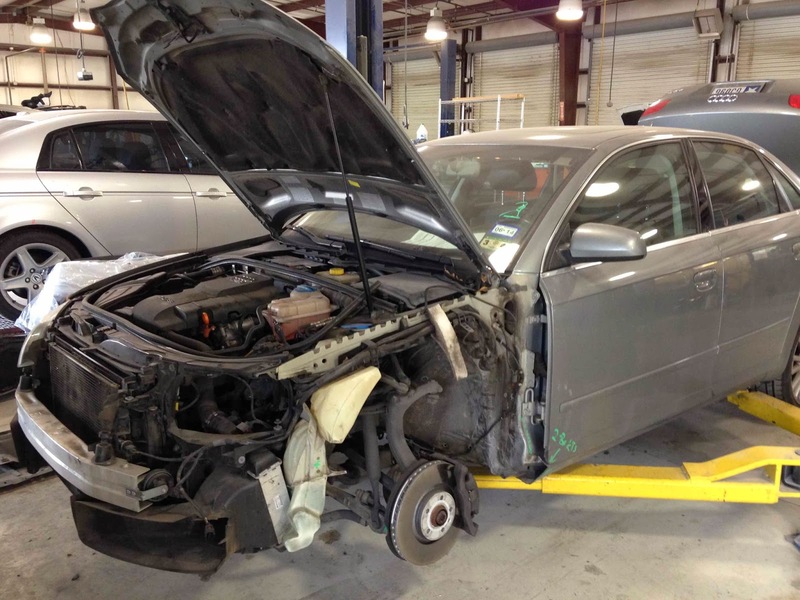 When that story went live on May 23rd, things went from crazy to surreal. 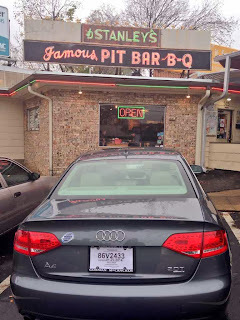 I had three weeks off between jobs to do some barbecue exploring, so I convinced my photographer Nick McWhirter to tag along on a Carolina barbecue road trip in early April. 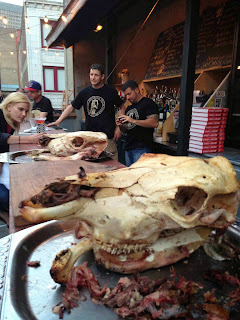 We ate plenty of pork, and got to chew a little fat with some of our counterparts on the East Coast. 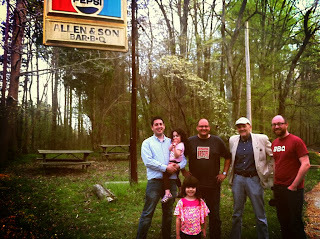 Author John Shelton Reed and blogger Dan Levine met us for a meal at Allen & Son in Chapel Hill, NC, while author Robert F. Moss met us on our final day in Charleston, SC. 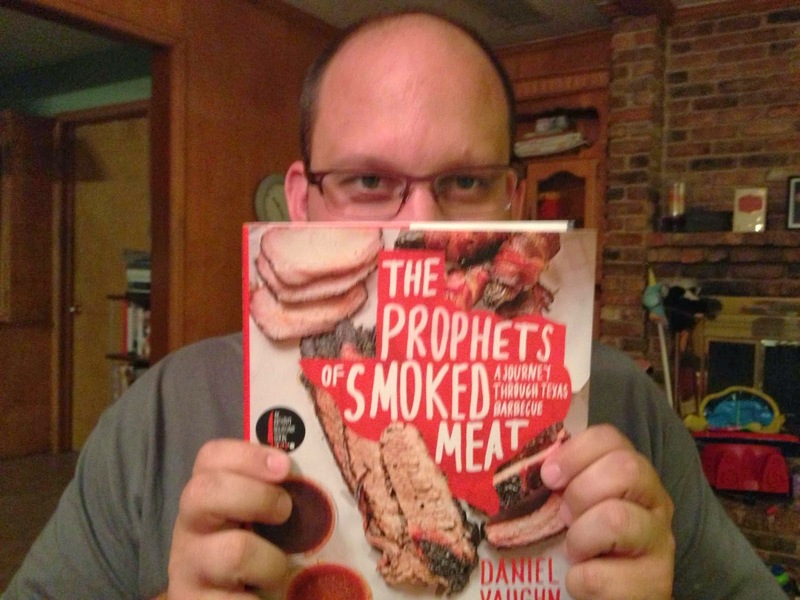 4/12: I got home to find the first real copy of my book in the mail. 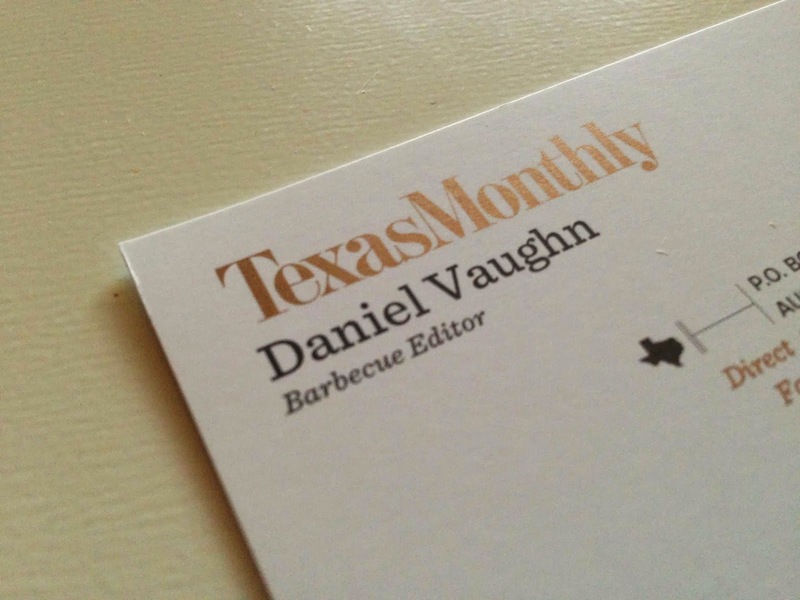 …and they gave me these cool business cards. 4/25: The first official event for the book launch was the TLA Conference in Fort Worth where I shared the stage with a friend and Texas BBQ mentor, Robb Walsh. 5/5: Texas Tech student Kristen Witherspoon made this drawing of me for a class project, which now is my Twitter avatar. 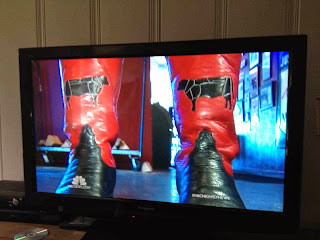 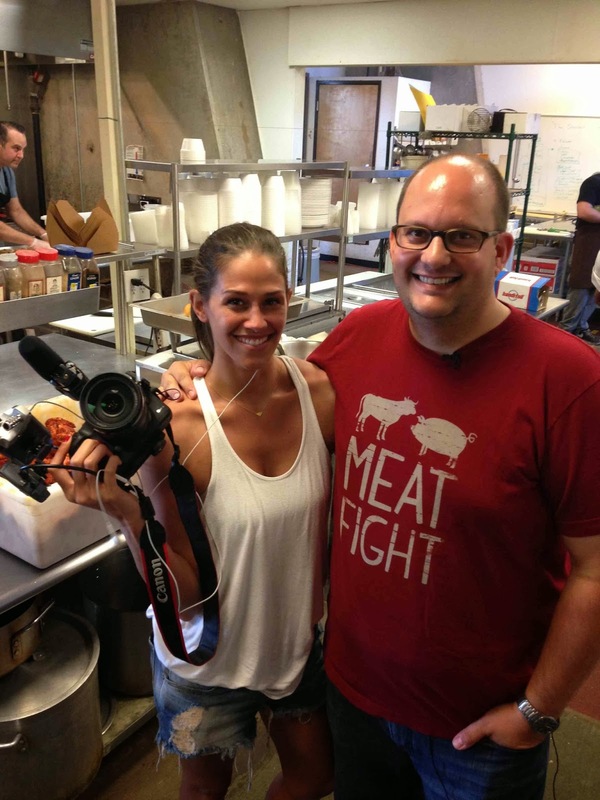 5/7: Interview with Nightline's Meredith Frost at Pecan Lodge. 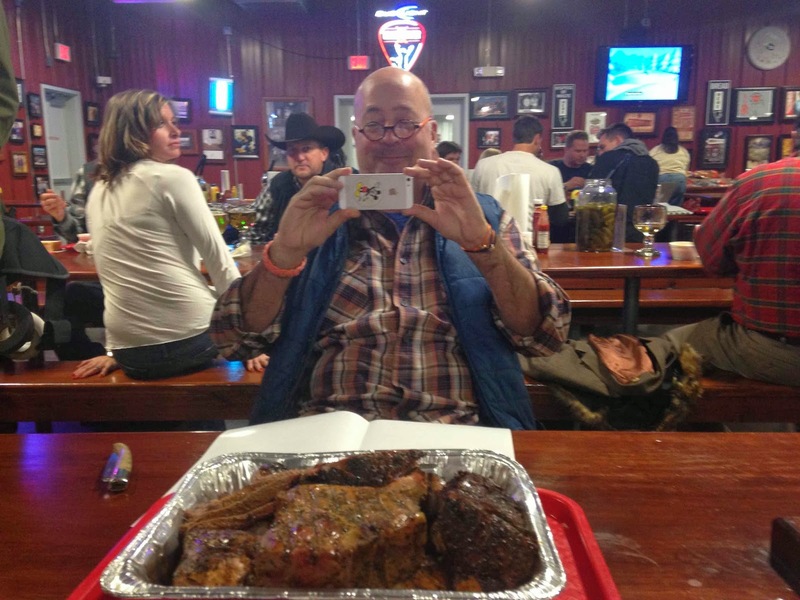 5/8: Interview with NBC's Kevin Tibbles during a Dallas BBQ road trip. 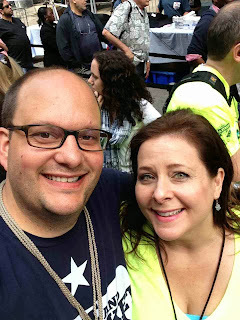 5/13: Travel to New York with my wife for the official book launch events. 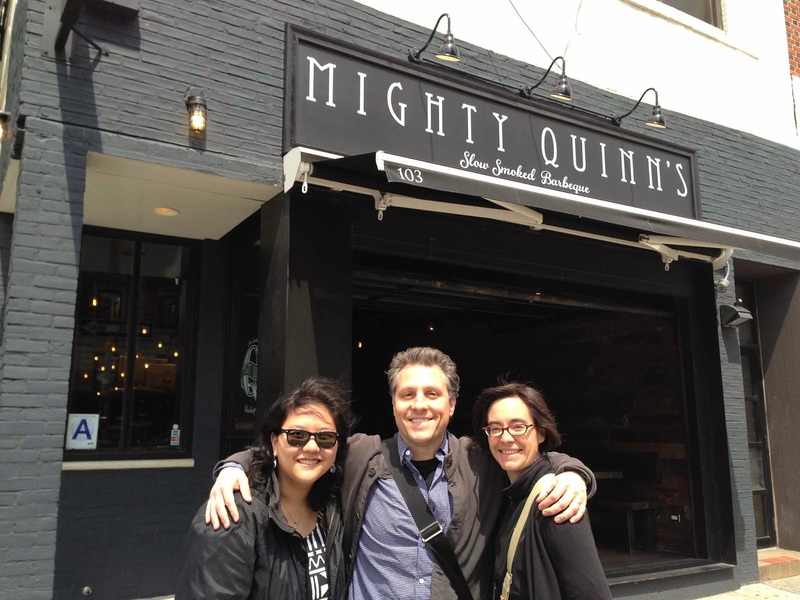 We spent the day going around town on a BBQ tour with New York food critics Pete Wells and Robert Sietsema. 5/14: The Prophets of Smoked Meat is out! 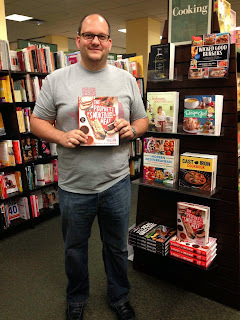 I spotted the first copy "in the wild" at a Barnes & Noble in Manhattan. 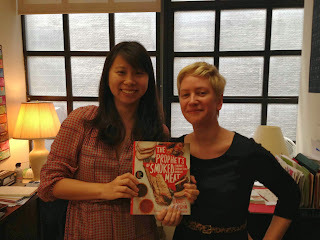 The book's designer, Suet, and my editor Libby were both excited for launch date. 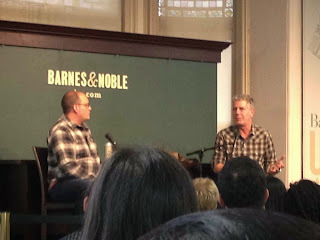 That evening I had an interview with Anthony Bourdain at the Barnes & Noble in Union Square. 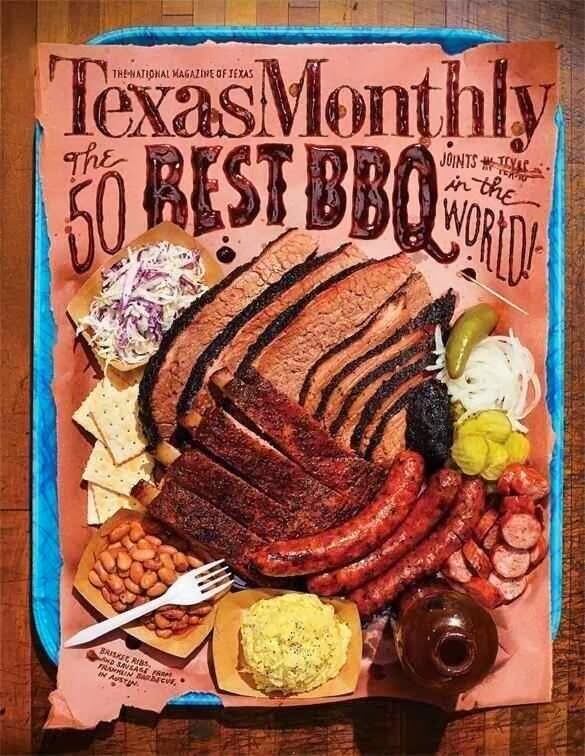 5/15: The Texas Monthly Top 50 BBQ Joints list is revealed while I'm still in New York making it my busiest day on Twitter ever. That night I had a book signing party catered by my friend Daniel Delaney of Brooklyn's Delaney Barbecue. 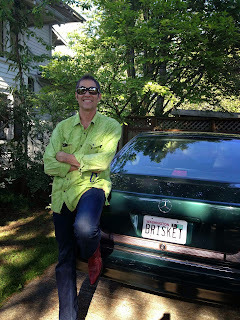 5/16: Celebration lunch at Le Bernardin with my agent David Hale Smith. There was a strict no photo policy that we enforced on ourselves. 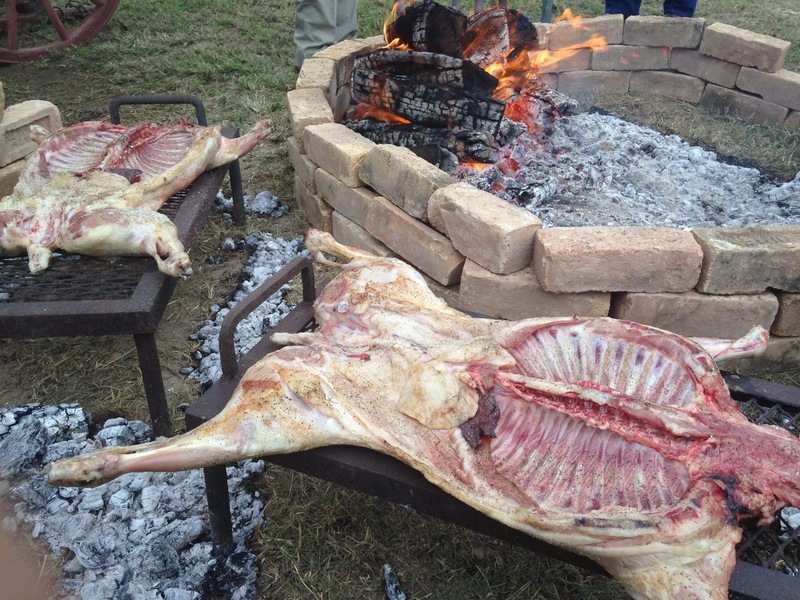 5/17: A ridiculous party was hosted by Steve and Anne Stoghill at their house in Dallas. Hundreds of people including the Dallas mayor came to enjoy barbecue from some of Texas's best pitmasters. I signed books through the entire party. 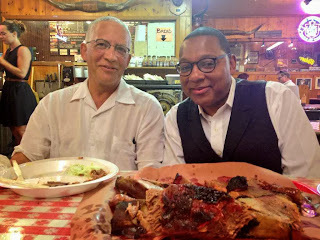 5/19: In Chicago with Tony. 5/21: Interview on NPR's Think with Krys Boyd. 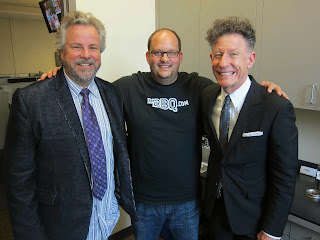 5/23: Interview at KUT studio in Austin where I met Robert Earl Keen and Lyle Lovett in the kitchen. 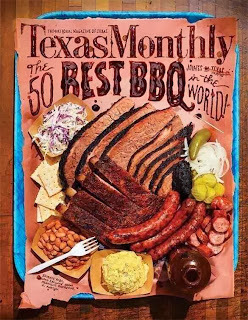 5/24: San Antonio book signing at Two Bros. BBQ Market. 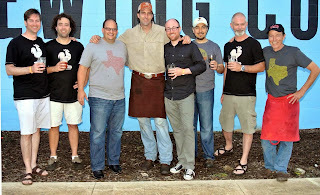 5/25: Book signing party at Four Corners Brewery in Dallas. 5/28: OKC book signing at the Semtner house. 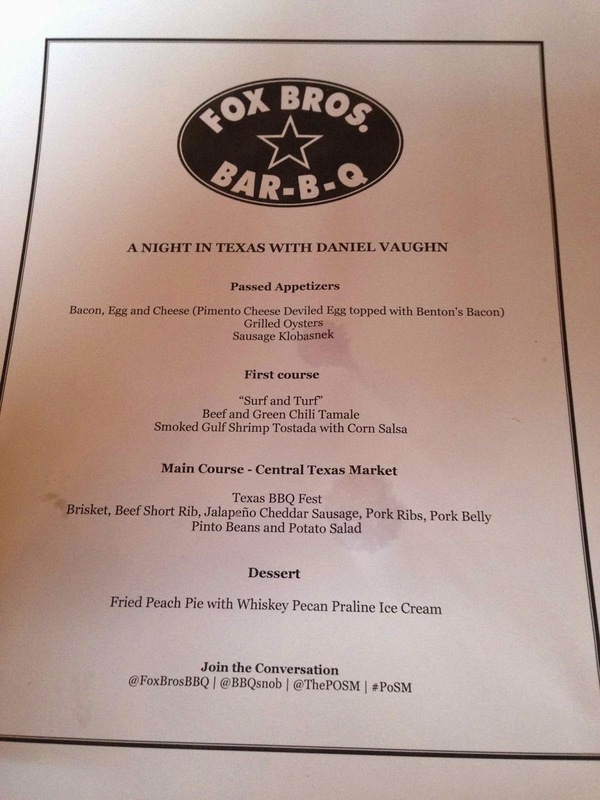 5/30: Book signing party at Fox Bros. BBQ in Atlanta. 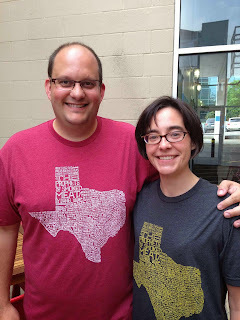 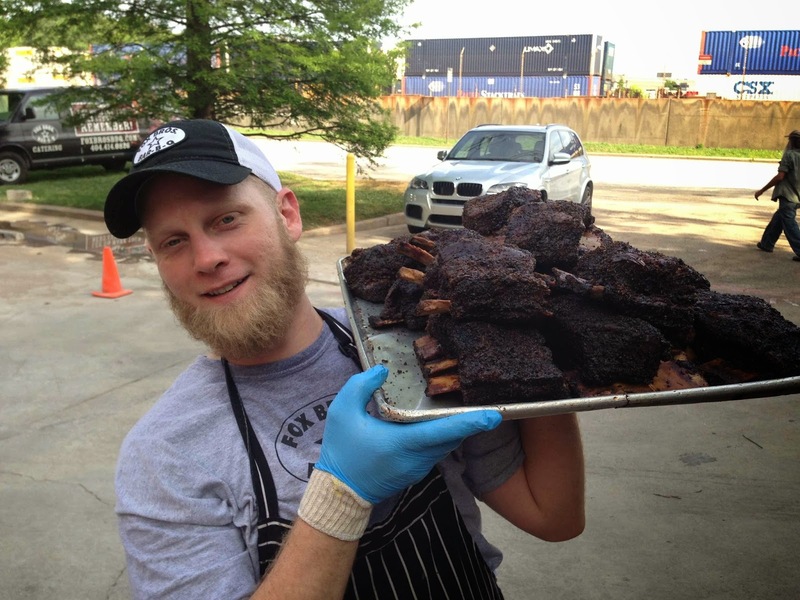 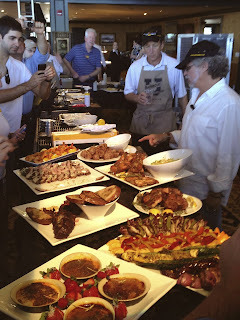 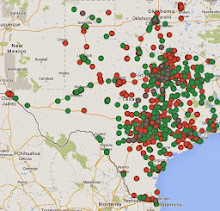 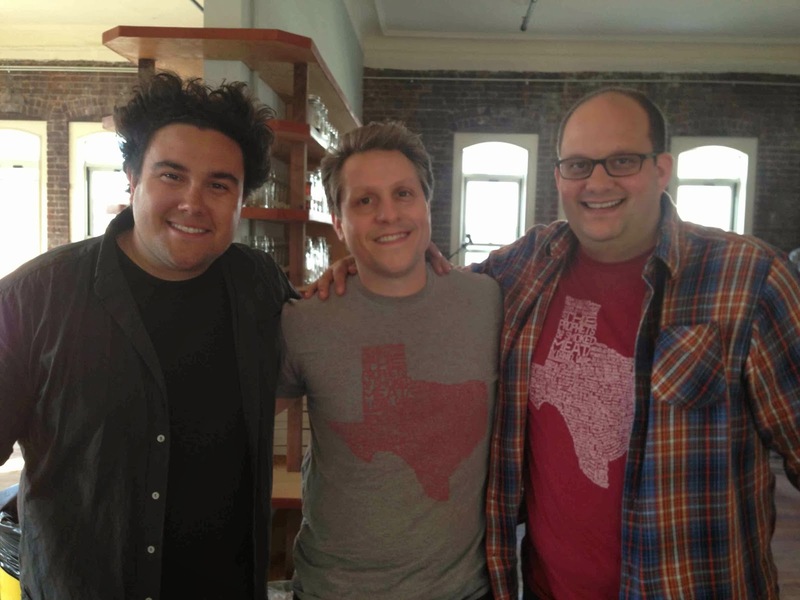 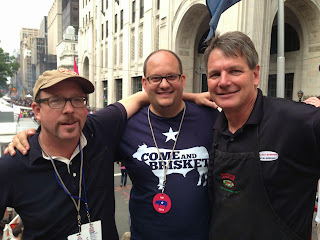 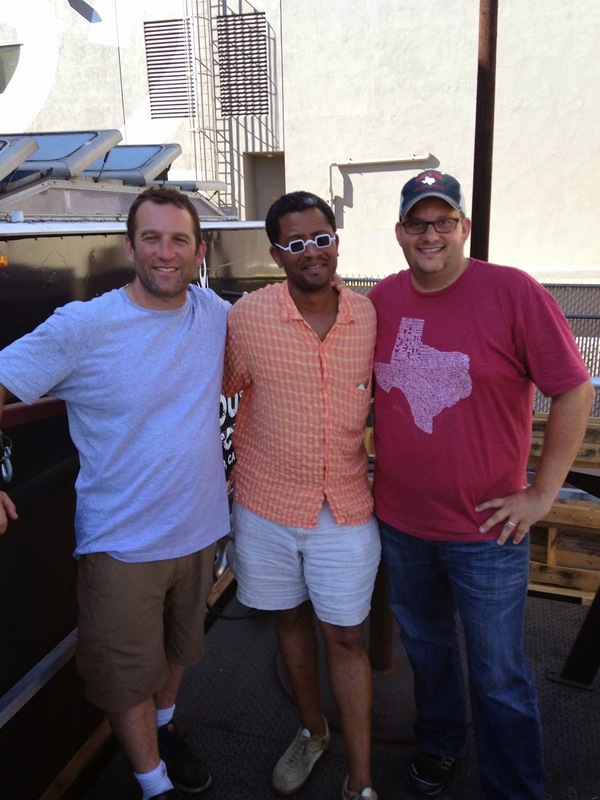 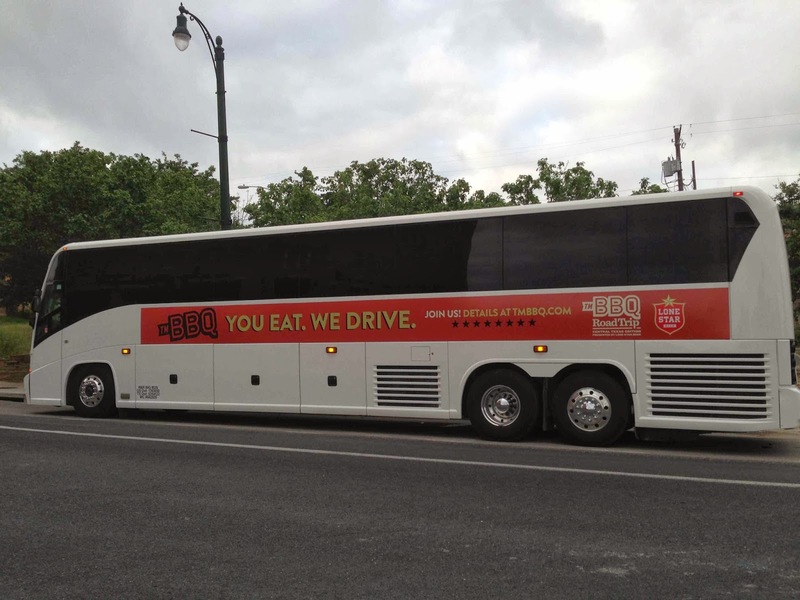 6/1: Texas Monthly BBQ Bus Tour to Snow's, Louie Mueller and Franklin Barbecue. 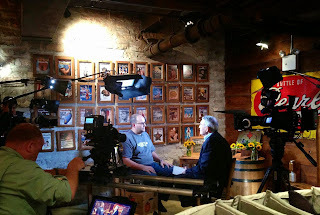 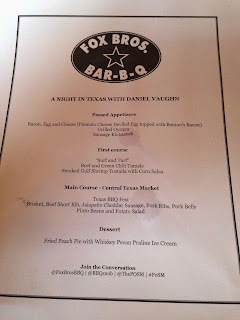 6/6: Interview with Dan Rather and Texas Monthly BBQ takeover with Aaron Franklin at Hill Country BBQ in New York. 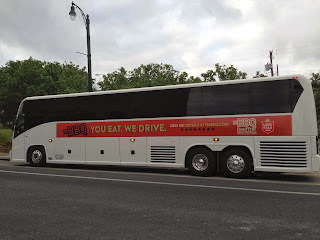 6/7: This morning was the worst event of the tour. 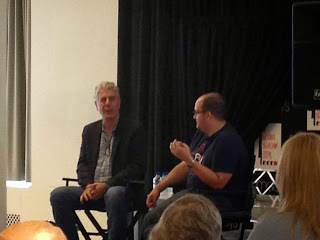 I went on the Opie and Anthony Show and it bombed. But the bonus was that I brought one of Aaron Franklin's briskets that was warmed in the kitchen of Le Bernardin. 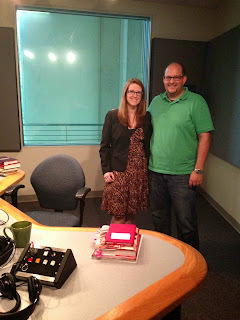 The interview later that day with an Austrailian morning show made up for it when the host ended the segment showing concern for my colon. 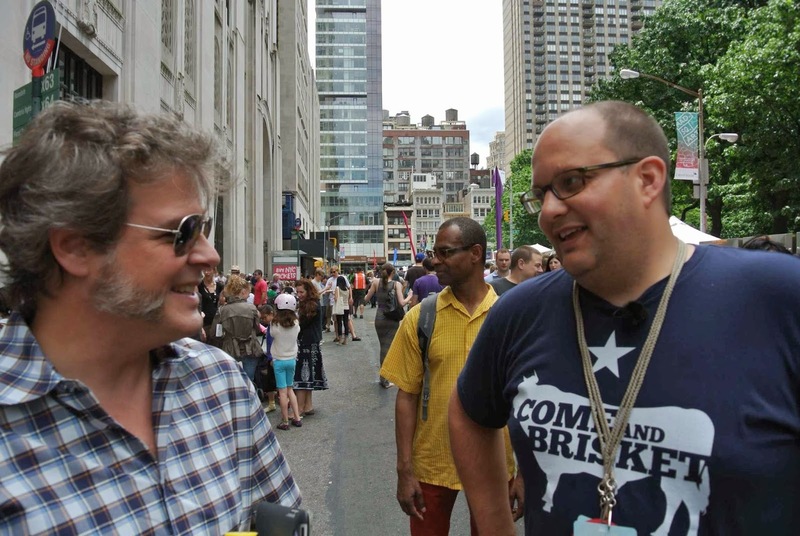 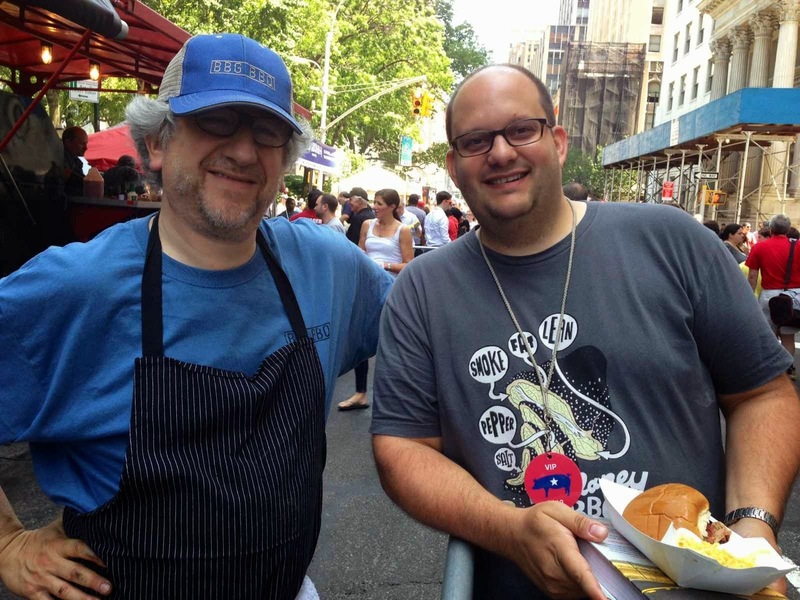 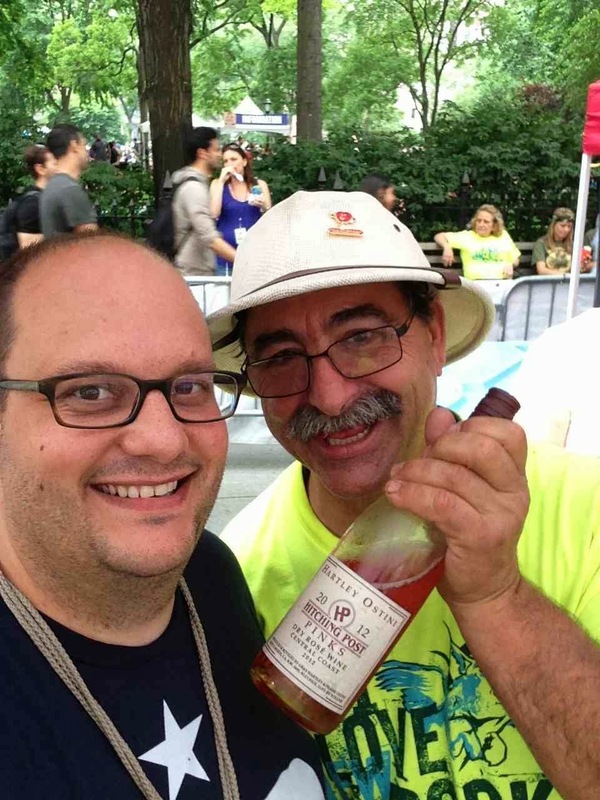 6/8 and 6/9: Big Apple BBQ Block Party. 6/? 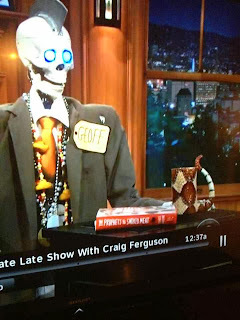 : Sometime in June my book showed up on the desk of Geoff who is the co-star of the Late Late Show with Craig Ferguson. 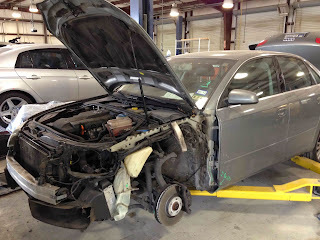 I have no idea how it got there. 6/10: BBQ University with Steven Raichlen in Colorado Springs, CO.
6/14: Book signing in Cleveland where they cooked a few cow heads for me at Greenhouse Tavern. 7/10: I smoked beef ribs for a cooking class put on by Tom Douglas in Seattle. 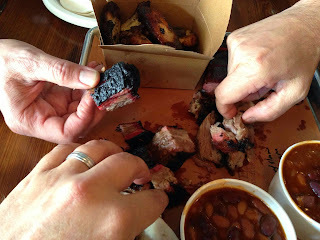 Later that night, Sir Mix A Lot raved about one of the leftover ribs at another Tom Douglas restaurant. 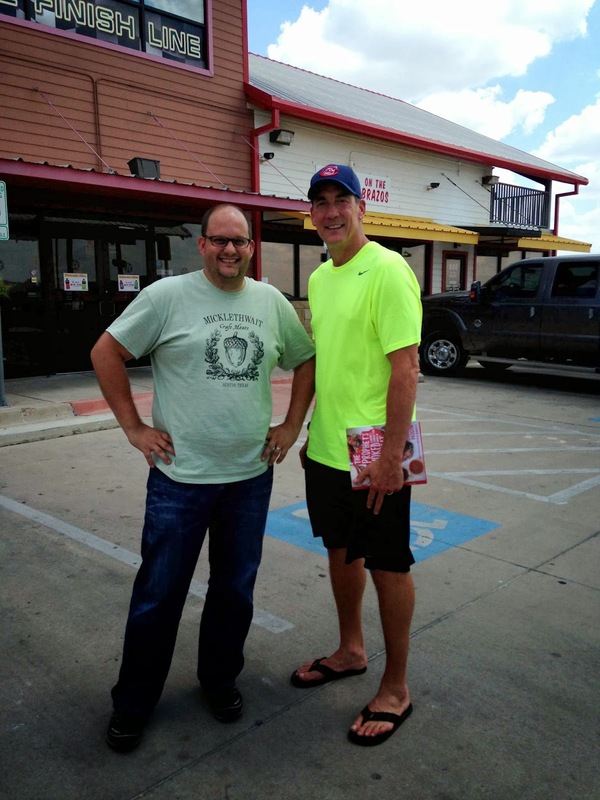 8/29: Took Todd Blackledge on a "Taste of the Town" scouting trip to BBQ on the Brazos in Cresson. It was featured in the LSU v. TCU game a few nights later. 9/4 and 9/5: Cooked with Adam Perry Lang in Los Angeles. 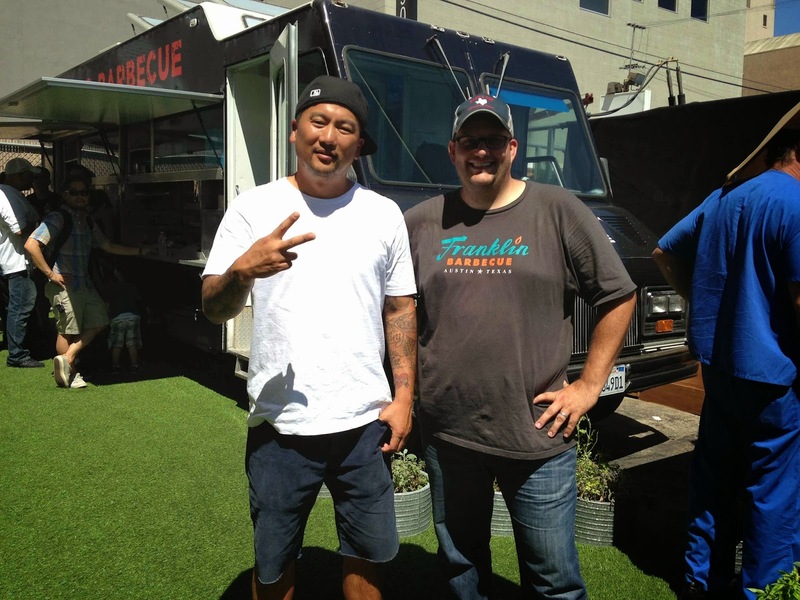 Got to chat with restaurateur and author Roy Choi and writer Lolis Eric Elie as well. 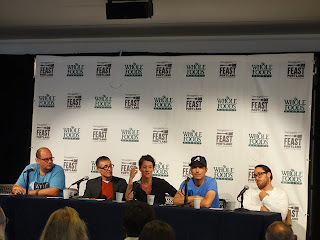 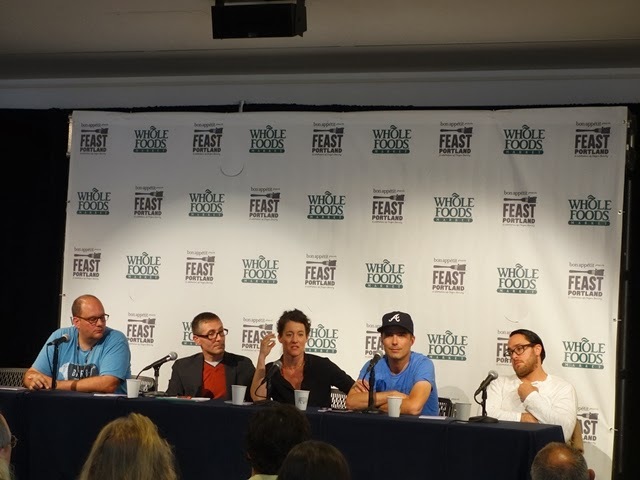 9/19: Spoke in a panel discussion on American food at Feast Portland with chefs Christopher Kostow, Naomi Pomeroy and Hugh Acheson. 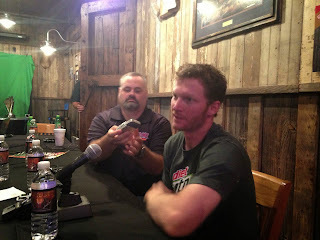 10/3: Sat in on a press conference with Dale Earnhardt Jr. and asked a few barbecue questions. 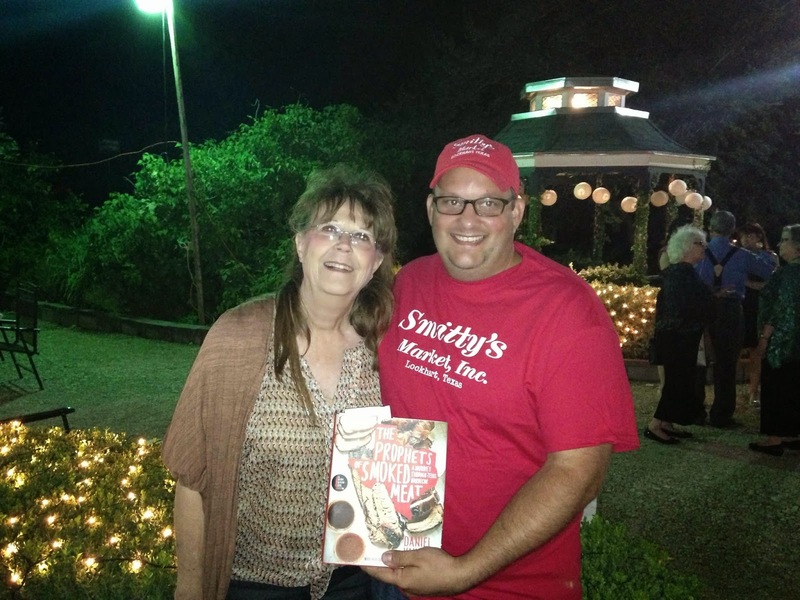 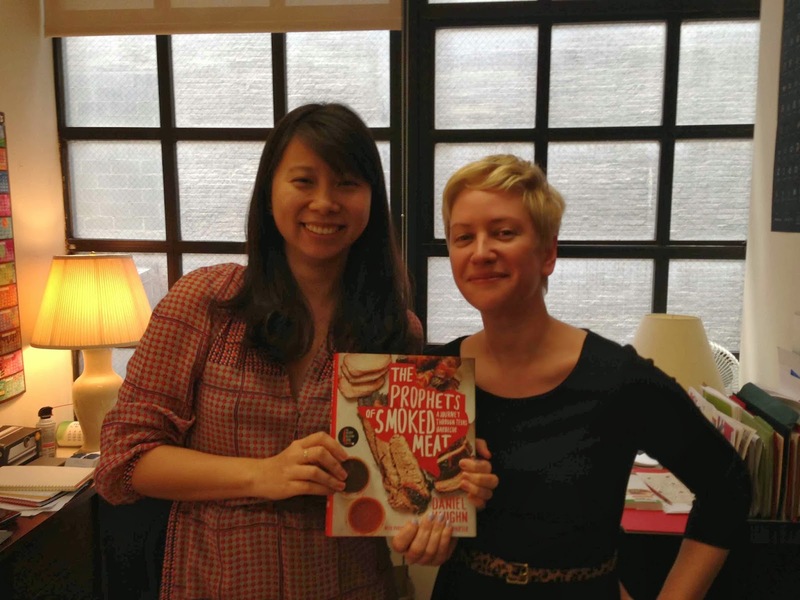 10/5: Met Nina Sells of Smitty's BBQ in Lockhart during a book signing. 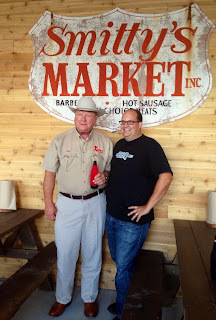 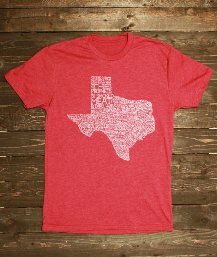 Despite my harsh words for Smitty's, she was very gracious and even gave me this Smitty's shirt to cover the Kreuz Market one I was wearing. 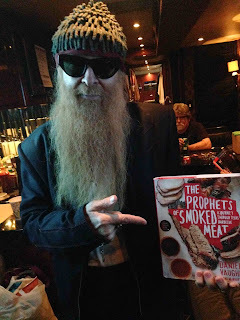 10/10: Andy Langer sent me this photo of ZZ Top's Billy Gibbons. 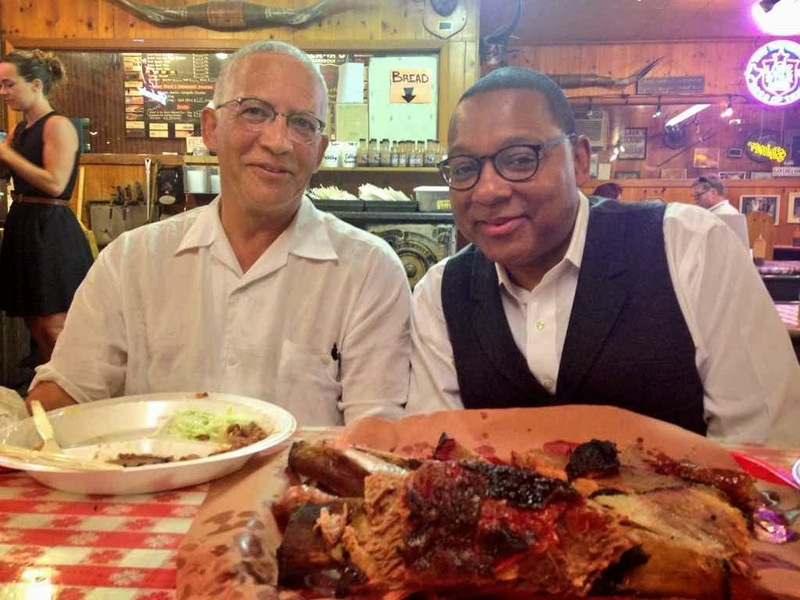 10/15: Filmed a segment with Frank Stewart and Wynton Marsalis in Lockhart for CBS Sunday Morning. 10/25: Talked with Rick Schmidt, former owner of Kreuz Market, at the opening of Schmidt Family Barbecue in Bee Cave, TX. 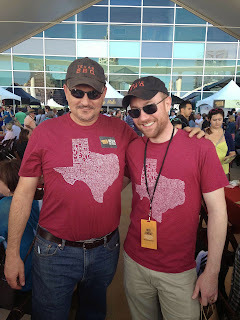 10/26: Attended the Texas Book Festival in Austin. 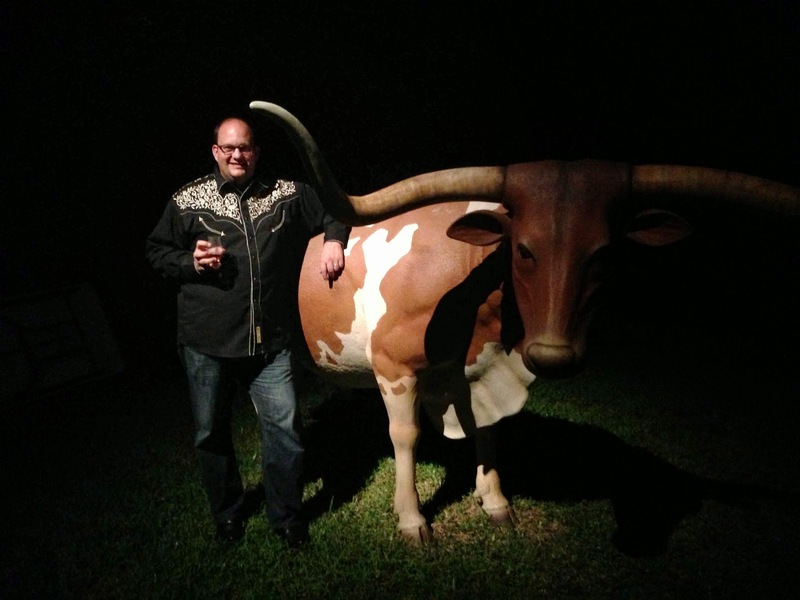 Spent and evening with a bunch of authors at the Paisano Ranch outside of Austin and witnessed a great party trick with grain alcohol. 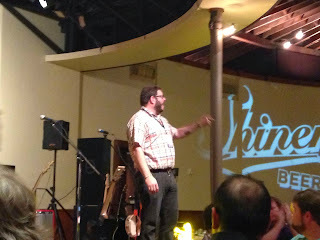 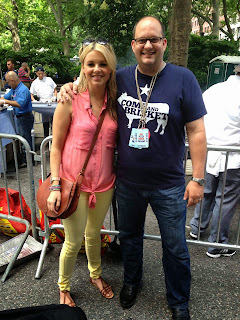 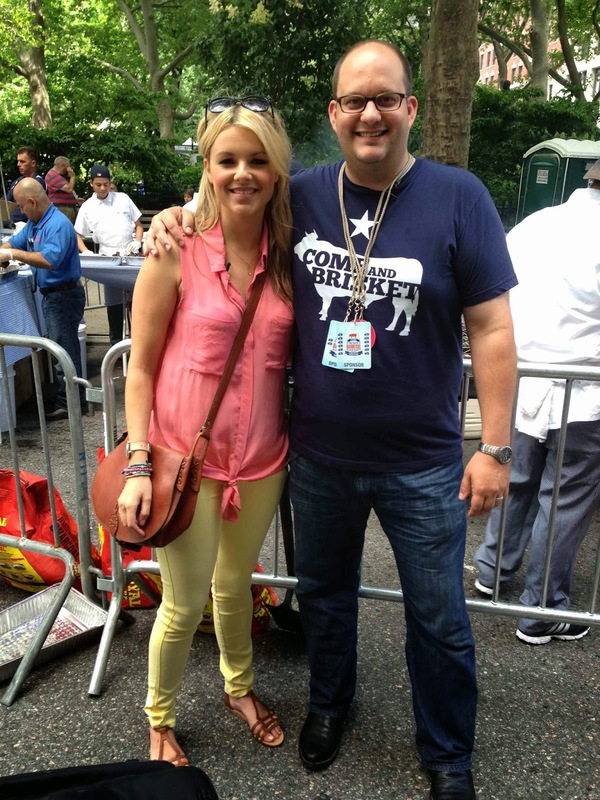 11/2: Met my nemesis, Josh Ozersky at Meatopia Texas. 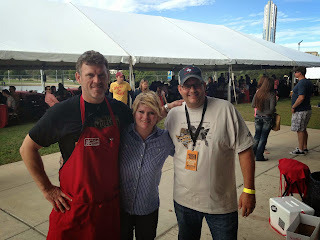 11/3: Texas Monthly BBQ Festival in Austin. 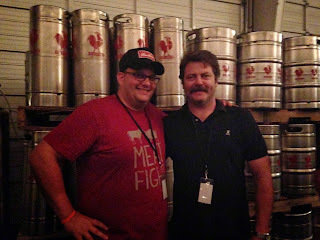 11/17: Judged Meat Fight in Dallas with Nick Offerman, aka Ron Swanson. 11/21: The BBQ Audi that had been my trusty road companion was totaled. 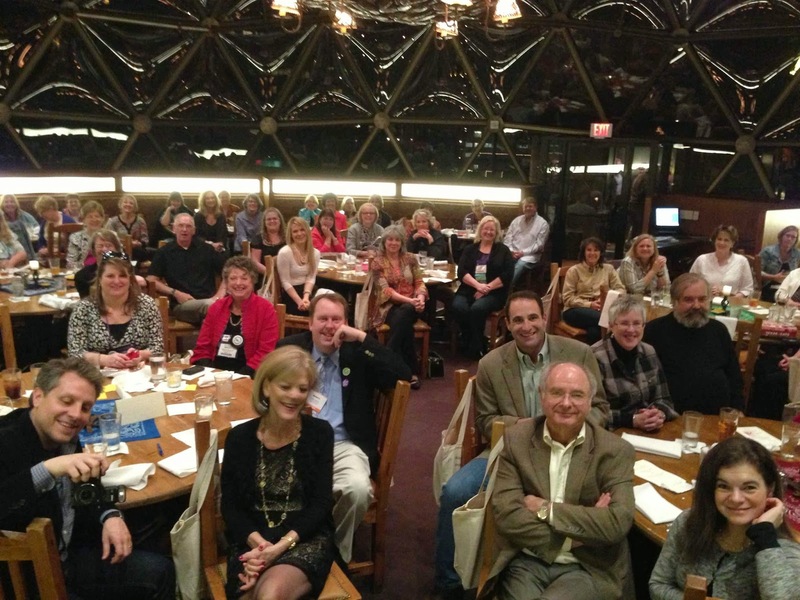 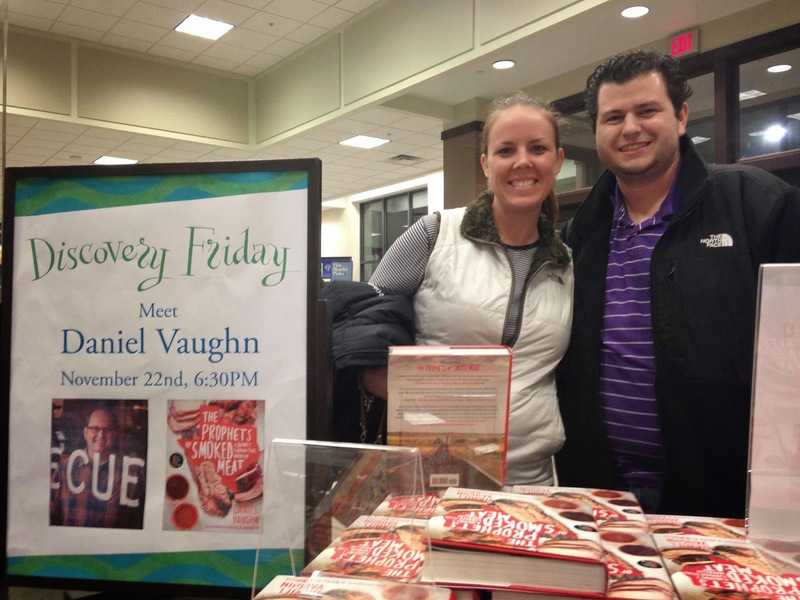 11/22: The most sparsely attended book signing I had was saved by these nice folks from Tyler, TX. 11/23: I drove to Longview to get a new BBQ Audi and stopped for barbecue in Tyler on the way back. 12/7: Judged the Linn-San Manuel cook-off and ate the finest cabrito of my life just north of McAllen. 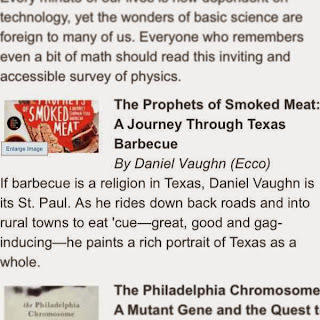 12/13: Learned that The Prophets of Smoked Meat was listed as one of the ten best non-fiction books of 2013 by the Wall Street Journal. 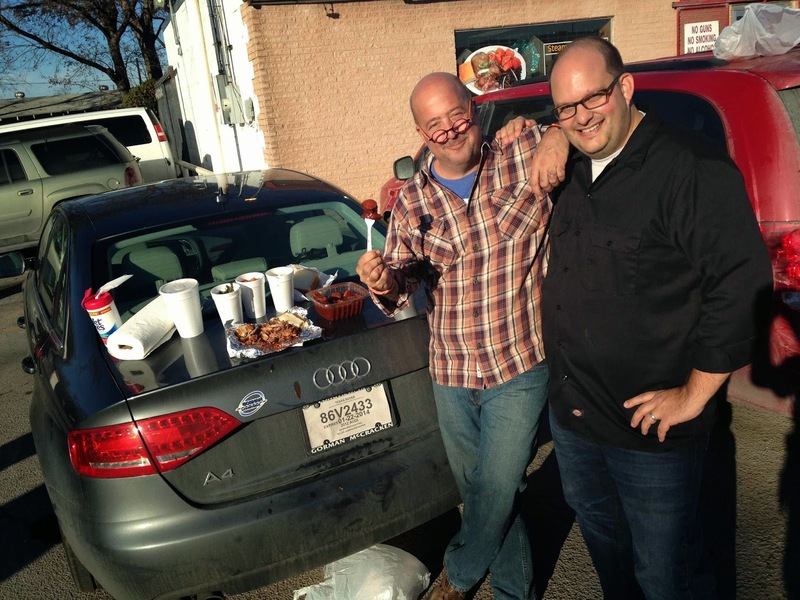 12/14 and 12/15: Filmed Bizarre Foods America with Andrew Zimmern in Dallas and Fort Worth. 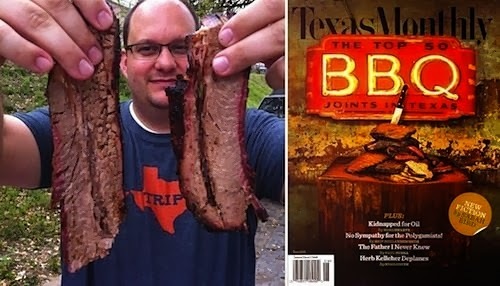 12/18: I received the January issue of Texas Monthly where my interview with Kreuz Market pitmaster Roy Perez appeared. 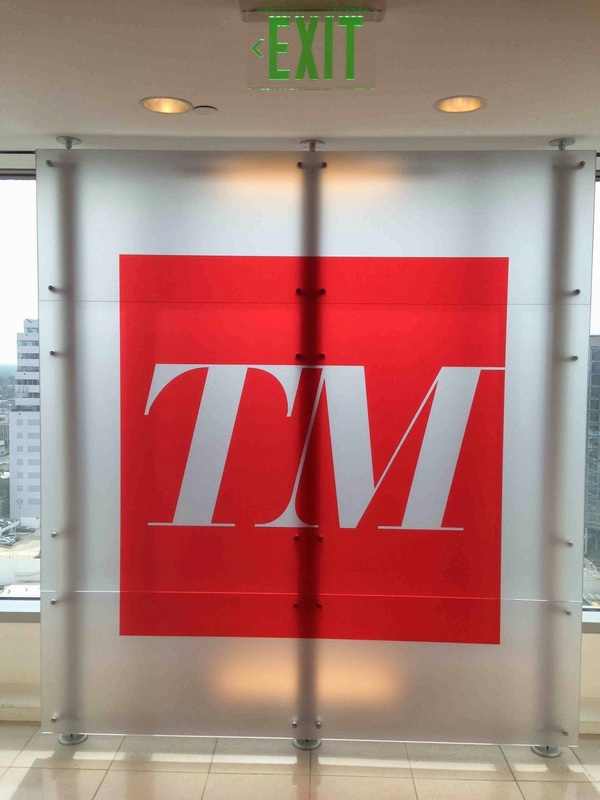 What an incredible end to an incredible year. I met so many incredible people and made some great friends along the way. 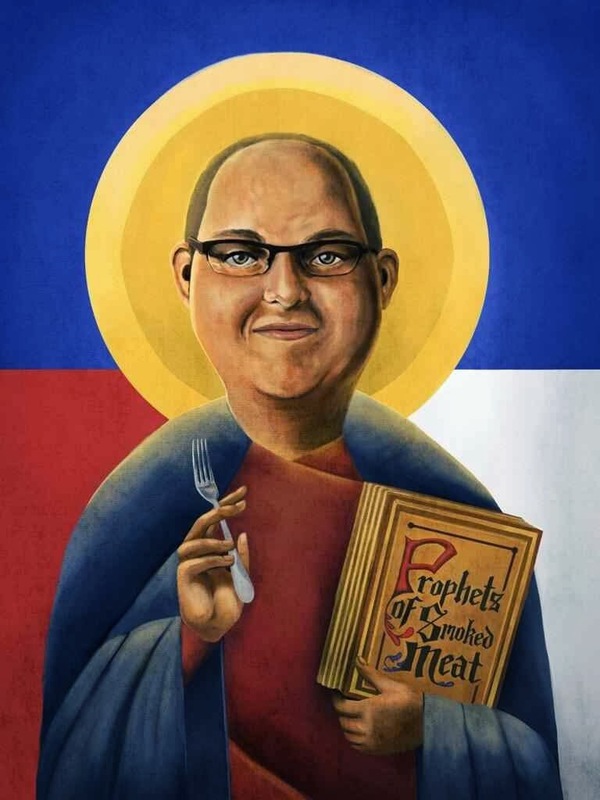 There are too many people to thank of making this such a fulfilling year, but I mostly have to thank my family for their patience. 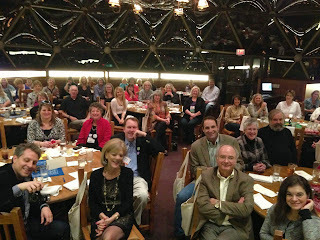 Their absence along the way is glaring in the photos above, but they know I've gotta keep working.